Five years have passed since Lo Wang shattered the alliance between his deceitful former boss and the ancient gods of the shadow realm. Despite noble intentions, Lo Wang’s efforts to annihilate the darkness corrupted the world, creating a strange and savage new order where humans and demons live side by side. The once feared warrior now lives in the shifting wildlands outside the reach of his enemies and the neon glow of Zilla’s cybernetic metropolis, scratching out a meager existence as a hired sword for the local Yakuza clans. When a simple mission goes wrong, Lo Wang is drawn into a volatile conflict between a brilliant young scientist, a controversial cult leader, and a terrifying new drug known as Shade. The sharp-tongued hero must once again wield lethal blades, staggering firepower, and archaic magic to purge the world of evil. ​Blades and Bullets – Lo Wang delivers his own brand full throttle brutality with an expanded array of over 70 lethal blades and explosive firearms to overcome the demonic opposition. 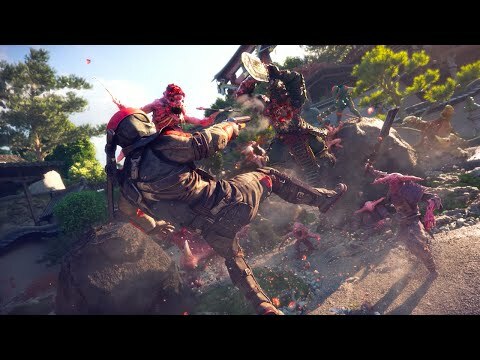 Become a whirlwind of steel and blood with razor sharp katana, short swords, crescent blades, and hand claws or unleash a hellish symphony of ornate firearms to decimate your enemies. Keep this game up ! can u give away key for me?